A third of the bedrooms at Bath’s iconic Abbey Hotel have been renovated to appeal to culture vultures following its of change of ownership a year ago. 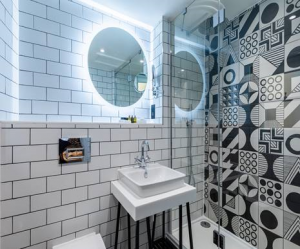 US-UK group KE Hotels, which bought the four-star, 62-bedroom venue in February last year, has invested what it described as a “significant” sum into upgrading 20 of the rooms in the latest phase of an ongoing project to modernise areas of the North Parade building. KE has also launched the exclusive Koffmann & Mr. White’s brasserie at the hotel and is redeveloping its ArtBar, with work set to complete over the next week. 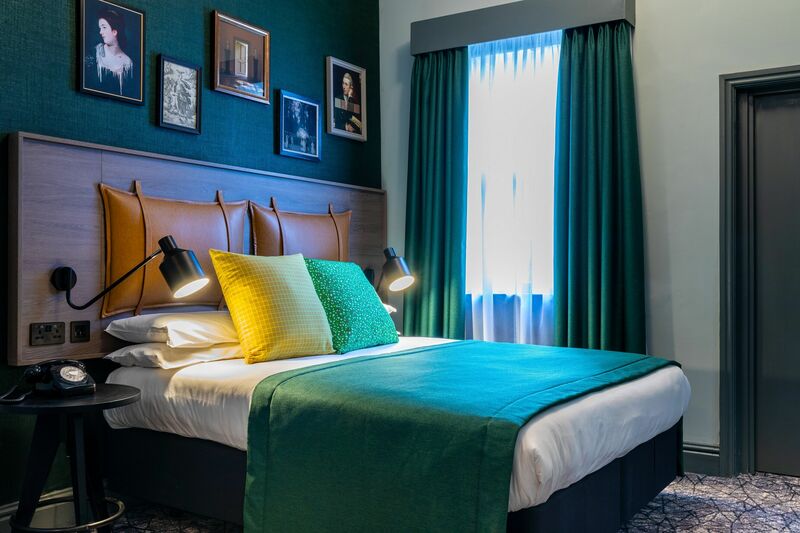 The firm said the new-look bedrooms would “fully immerse guests in Bath’s thriving arts scene”, with the rooms given a stylish makeover to cover three creative themes – film, art and photography. 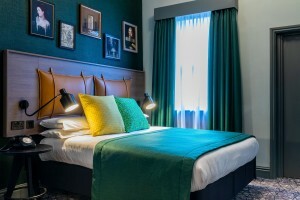 From modern lighting to framed artwork and vibrant colour schemes, the concept for each bedroom is based on the city’s connections to art and culture over the years, pictured above. Each premium room has a modern en-suite bathroom with geometric black and white design, superior lighting and luxury shower facilities, pictured below. The cinematography bedroom scheme has a connection to William Friese-Green, who experimented in the first stages of motion pictures in his Bath studio, contributing to the development of movie camera technology. This has been reflected with bric-a-brac movie reels mounted above the bedhead and illustrative artwork on clipboards. The illustrations are connected to the cinematography artform and sketched onto Bath-related book pages. The lighting design gives a nod to the old-fashioned camera flash and the fabrics provide a rusty sepia tone to the rooms. The print room scheme has developed from Bath as a home to one of the biggest photography clubs, The Royal Photographic Society of Great Britain, which has been based in the city since the 1970s. The concept has been reflected in the sophisticated grey scale fabrics with fine weaved details, paired with graphic prints. Artwork in this room category has been printed onto Perspex and presented on wall-mounted display easels above the bedhead. The high end gallery bedroom scheme focuses on putting the guest into an art gallery. This is formed from Bath’s current connection with art and culture, from its many galleries, exhibitions, theatres, and promotion of new upcoming artists. A feature gallery wall has been produced above the bedhead using a range of artwork styles and frames. The room boasts bright graphic fabrics and mixes of colour from deep greens and blues, to vibrant yellow. The Abbey Hotel also includes The Escape, a former World War II bunker under the hotel, provides a contemporary private event and function space. Abbey Hotel general manager Josh Watts said: “We’re really happy with how the new rooms look. This is the latest in a line of renovations to modernise the hotel and make the Abbey a thriving cultural hub for guests. The balance of the newly designed modern rooms alongside our more traditionally-styled rooms, means we can cater to a variety of different guests. KE Hotels bought the Abbey Hotel from established Bath hoteliers Ian and Christa Taylor, who since have since taken over the city’s 22-bedroom County Hotel – now rebranded as The Bird, Bath – and the 21-bedroom Homewood Park to add to their existing boutique hotel No.15 Great Pulteney Street. Founded in 1989, KE (Khanna Enterprises) is a family-owned business with eight high-end hotels in the UK and US. After returning from working in the US office in 2001, younger brother Anil Khanna now manages the UK branch of the business (KE Hotels) consisting of the Best Western Plus Linton Lodge in Oxford and the 145-bedroom Manchester Moxy by Marriott Hotel, which started construction at the end of last year, along with the Abbey Hotel.